Alma City Hall is located at 314 North Main Street, Alma, WI 54610; phone: 608-685-3330. Photo: Frederick Laue House, ca. 1866, 1111 South Main Street, Alma, WI. Listed on the National Register of Historic Places in 1971. Photographed by user:	Travelerlee, 2014, (own work) [cc-by-3.0 (creativecommons.org/licenses/by/3.0)], via Wikimedia Commons, accessed November, 2014. Alma is a unique, small upper Mississippi River town in Wisconsin that has changed little since its significant heyday in the 1870s and 1880s. During this period, Alma played an important role in the history of the Wisconsin lumber industry as the river port adjacent to Beef Slough, the key Mississippi River staging area in the transportation of logs and lumber from the pineries of the Chippewa Valley. In the late 1860s, Beef Slough was the focus of a contest, known as the Beef Slough War, between rival logging interests which ultimately contributed to Frederick Weyerhaeuser's ability to gain virtual monopolistic control of the Chippewa Valley pineries. The visible remains of the Beef Slough booming operation have disappeared, but Alma, the rough-and-tumble little river town that served Beef Slough, survives as a tangible reminder of the life of those early days. 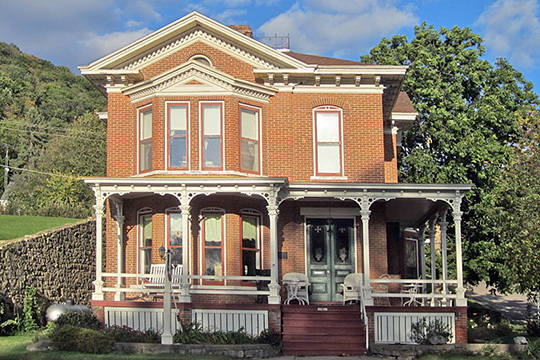 Evidences of that era are most apparent in the central portion of the Alma Historic District. One thing railroads could not do as well as their waterborn counterparts was to cheaply and efficiently move huge quantities of virgin timber downstream to waiting lumber mills. At the north end of Alma, the sluggish channel of the Chippewa River (Beef Slough) empties into the Mississippi. Recognizing its potential as a sorting harbor for the millions of pine logs yearly banked along the upper reaches of the Chippewa, three local entrepreneurs, Conrad Moser, John Hunner and Frederick Laue, Sr., in conjunction with three other investors, incorporated the Beef Slough Manufacturing, Booming, Log Driving and Transportation Company in 1867. Their efforts were soon thwarted by the milling interests up river at Eu Claire and Chippewa Falls, through a series of confrontations, legal and otherwise, which came to be called the "Beef Slough War." Eventually the downstream advocates, through some legislative chicanery, won the day and a significant number of logs were successfully floated to Beef Slough where piers and catch booms had been erected. The facilities proved to be ideal for sorting and rafting logs. However, the conflict that periodically threatened to erupt into violence was so detrimental to business that the company foundered. In 1870 the Mississippi Logging Company was organized in Iowa by Frederick Weyerhaeuser, who learned of the bankrupt Beef Slough Company operations. In all, more than 5-billion board feet of timber was rafter out of the boom at Beef Slough between 1867 and 1889. During its height in the 1880s, over 600 men were employed there at nine separate camps, spread along the slough's 20-mile length. Barbara Anderson-Sannes and Michael William Doyle, Research Historians, Alma Historical Society, Inc., Alma Multiple Resource Area, Buffalo County, WI, nomination document, 1980, National Park Service, National Register of Historic Places, Washington, D.C.